In honor of Throwback Thursday, which is running rampant on social media sites. I decided to do a little ode to my new favorite sitcom, The Goldbergs on ABC. This is actually a really good show, the stories told are funny yet sweet and the actors on the show really make this a stand-out sitcom in a sea of crappy shows that never make it past Season 1. The best part of the show is the end when the creator of the show Adam Goldberg shows us actual footage from his life that correlates with what happened on the show all via his old skool camera. As Table9Mutant has been doing her blogathon on John Hughes, it got me thinking that this show really is reminiscent of one of his movies. As a child of the 80’s, these are the movies I grew up loving, they were filled with life lessons, heart breaks and overall just funny moments in growing up and The Goldbergs really do this genre justice. 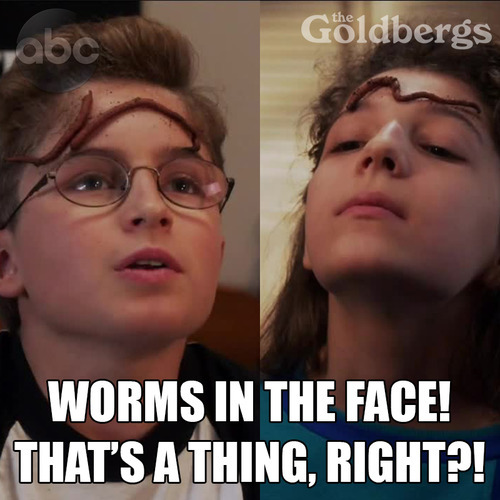 Here are 10 80’s Throwback Moments from the Goldbergs. 1. That time when our mother’s thought they knew it all and reminded us every DAY! 2. And our older siblings or relatives knew best and we believed them. 3. When being on the telephone was EVERYTHING. Where was the iPhone back then when I needed it?! 5. And calling your mom was always the rule, yet finding quarters was so hard. 6. Renting videos was not easy like today. Late fees, low stock in store, made the decision of which movie to watch so difficult. 7. Before PlayStation, Halo and all that stuff there was Zelda. You played till your fingers bled. 8. The fashion was horrendous yet we thought we looked cool. 10. Lastly, it was a time when things were simple and being yourself was the most important thing. I’m glad you liked it! You should watch it, if you have kids I’m sure they would love it. They’re 5 and 2.5. Might not be old enough? Yeah prob too little! Awww are you making them watch the classics already? Where do you live again? DUDE! You would love it… it’s basically a John Hughes movie in a show. England. : ) For over ten years. I’m American. I better see if I can track this down! oh that’s cool! I have always wanted to go there… can you try abc.com… you might be able to watch on there. As we said before… bloody wankers! Speaking of 80’sness – did you watch that show Glory Daze? I was pissed that got cancelled!! You got me on one ! I never saw it. Was it good?